Cet article examine l’intérêt du philosophe Maurice Merleau-Ponty pour la peinture et le mode de perception du peintre Paul Cézanne. Alors que l’on a souvent limité la fascination du phénoménologue pour l’artiste aux deux textes célèbres, « Le doute de Cézanne » et L’Œil et l’esprit, cet article montre que la place que tient Cézanne dans la réflexion du philosophe imprègne d’autres écrits importants et nourrit la pensée du phénoménologue. Cézanne joue un rôle décisif dans l’élaboration des concepts clefs qui articulent le projet et la méthode phénoménologiques (e.g. chiasme, expression, le motif). Plutôt que de nous limiter à la façon dont Merleau-Ponty nous aide à saisir ce qui est unique dans les tableaux de Cézanne, cet article se propose de montrer comment la pensée du philosophe a été elle-même façonnée par ce qu’il trouvait dans la peinture cézannienne. Là où l’on croyait n’avoir affaire qu’à une perspective particulièrement lucide apportée sur l’œuvre de l’un des pères de l’art moderne, on sera peut-être surpris de trouver une identification conceptuelle et philosophique plus profonde entre penseur et peintre. This article investigates Maurice Merleau-Ponty’s philosophical engagement with the painting and unique mode of perception of the artist Paul Cézanne. While the phenomenologist’s fascination with and treatment of the painter have often thought to be limited to the two celebrated pieces, “Cézanne’s Doubt” and Eye and Mind, this article shows that this is not the case. Instead, one finds that Cézanne plays a decisive role throughout Merleau-Ponty’s entire œuvre and in the elaboration of concepts of central importance to the philosopher’s phenomenological project and method (e.g., chiasme, expression, le motif). Rather than limiting ourselves to how Merleau-Ponty helps grasp what is unique about Cézanne’s painting, this article addresses the question of how the philosopher’s thought was itself shaped by what he saw in Cézanne’s canvases. Where we once believed to discern only a particularly lucid perspective on the work of one of the fathers of modern art, we may be surprised to find a deeper, conceptual and philosophical identification between thinker and painter. Doctorant en littérature française à l’Université de Princeton (New Jersey, États-Unis), mes recherches concernent la poésie et l’art français modernes, particulièrement dans leurs rapports avec le cinéma et avec la philosophie continentale et analytique du XXe siècle. Mon projet de thèse pourrait aborder la réception allemande des écrits de Baudelaire dans la première moitié du XXe siècle, surtout dans les textes de Walter Benjamin, de Theodor Adorno et de Rainer Maria Rilke. Je travaille aussi sur l’histoire de l’esthétique, m’interrogeant sur la façon dont une pensée logique et critique française du XVIIe et du XVIIIe siècles a joué un rôle déterminant, mais peu étudié, dans la pré-élaboration de ce domaine de la philosophie traditionnellement restreint aux penseurs plus modernes, tels Baumgarten, Kant, Hegel et Schopenhauer. Consider a black and white photograph of a man (Fig. 1). Shirtless and smoking, he looks out from atop what appears to be a cliff, gazing off into the hazy landscape that spreads out before him. Although there is an abundance of similar shirtless—and/or smoking—photos of Maurice Merleau-Ponty, the man seen here, this one may be the most intriguing. The time was summer 1960. The place : the summit of Mont Sainte-Victoire. Merleau-Ponty travelled to Aix-en-Provence, a site immortalized by Cézanne’s paintings, to gaze on the same landscape that had been the painter’s passion and inspiration, to retrace in the flesh the painter’s ascension of the mythic mountain . As Claude Lefort writes : “[Merleau-Ponty s’est] installé, pour deux ou trois mois, dans la campagne provençale, non loin d’Aix, au Tholonet, dans la maison que lui avait louée un peintre…jouissant chaque jour du paysage qui porte à jamais l’empreinte de l’œil de Cézanne” . L’Œil et l’esprit was the product of this summer stay in the Aixois countryside. The article was written between the months of June and August 1960, and was published in January of the following year, just months before Merleau-Ponty’s untimely death in May 1961. Fig. 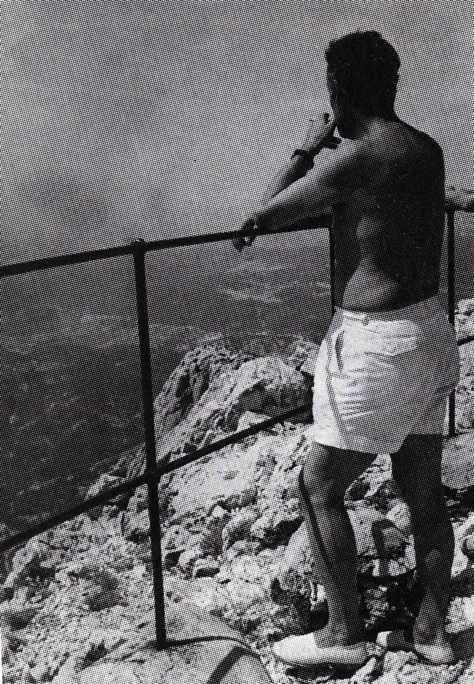 1 : Merleau-Ponty at the Summit of Mont Sainte-Victoire, summer 1960 © 2012 Bibliothèque Nationale de France. All rights reserved. Turning to the last page of L’Œil et l’esprit, one finds the author’s inscription : “Le Tholonet, juillet-août 1960”. Recording the date of a piece of writing was nothing new, and a habit Merleau-Ponty kept throughout his entire career. Recording the place of an article’s drafting was something different. It must have been being there that was so important, that had to be recorded : being there, at Le Tholonet, living and writing where Cézanne once lived, gazed and painted. Intrigued by L’Œil et l’esprit and by the story behind this black and white photograph, I began to delve into Merleau-Ponty’s writings in search of texts, beyond the well-known “Le Doute de Cézanne” and L’Œil et l’esprit, that might, like the landscape around Aix-en-Provence, bear the trace of the painter’s presence. I wanted to find out what motivated Merleau-Ponty to write on Cézanne, when this writing began, and how important it was to the philosopher. The topic of Merleau-Ponty’s interest in Cézanne has to some extent been directly addressed before, notably by Forrest Williams in his 1954 article, “Cézanne, Phenomenology, and Merleau-Ponty” . Williams’ article aims, he tells us, to “investigate the possibility of some common ground between a modern artistic genius and a current philosophical development” . Williams doesn’t push the point, yet his basic intuition is correct : Merleau-Ponty considered Cézanne’s method of painting as similar if not completely analogous to his own philosophical project. Indeed, Merleau-Ponty’s identification with Cézanne was taken to such extremes that there are moments in the philosopher’s writings when the goal of phenomenology and the goal of Cézanne are expressed in identical terms . There are even moments when Cézanne’s own words, recorded especially by Joachim Gasquet, sneak out of Merleau-Ponty’s pen, sometimes with no quotation marks to signal the appropriation. I will not go into what Williams got wrong here ; rather, I want to emphasize what he got right : the existence of a “common ground between” the philosopher and the painter, a profound identification that Merleau-Ponty felt between himself and Cézanne. The present study is divided into two main sections. The first focuses on Merleau-Ponty’s principal texts and notes on perception, ontology and expression, extracting and investigating the ever-present preoccupation with Cézanne. While “Le doute de Cézanne” and L’Œil et l’esprit form the core of this engagement, direct and indirect references to the painter are by no means limited to these two texts. In fact, Cézanne appears for the first time in Merleau-Ponty’s earliest major publication, La structure du comportement of 1942. References to Cézanne and citations of Joachim Gasquet’s book on the painter are ubiquitous in Merleau-Ponty’s magnum opus La phénoménologie de la perception of 1945, where they often come to the fore at crucial moments or to illustrate main concepts. Continuing chronologically : “Le doute de Cézanne”, also published in 1945, is Merleau-Ponty’s only text devoted entirely to the painter. Cézanne is also mentioned in the conference “Le cinéma et la nouvelle psychologie” (March 1945). He appears next in the “Projet d’enseignement” of 1951, and again in two posthumously published texts : the first, “L’expression et le dessin enfantin” , most likely written in the winter of 1951-1952, and a text composed sometime before April 1952 as a job application for a spot at the Collège de France . In “Le langage indirect et les voix du silence”, published in 1952, Merleau-Ponty places Cézanne within a discussion of theories of pictorial and literary expression. During the following years, marked most significantly by his conflict and rupture with Jean-Paul Sartre, Merleau-Ponty’s fascination with Cézanne seems to have remained dormant, waiting until 1960 to reemerge at the center of L’Œil et l’esprit, in the 1960-61 Notes des Cours from Merleau-Ponty’s class at the Collège de France , and obliquely in the unfinished Le visible et l’invisible, published in 1964. I only lay out the texts in this order to give a general sense of the breadth of Merleau-Ponty’s writings on Cézanne. In this paper I proceed thematically : I found that many of the philosopher’s ideas on Cézanne are reworked and revitalized throughout the nearly twenty years they span. I focus on the themes of approach, the primordial, the concepts of le chiasme, expression, and le motif, because these are the main points of contact where the identification between philosopher and painter is most explicit. The final part of the present study attempts to suggest what Merleau-Ponty found in Cézanne’s actual paintings. Specifically looking at Cézanne’s late landscape paintings, I argue that Merleau-Ponty found in them a “philosophie figurée”  of vision and of embodied existence, an invitation to see the “mouvement permament” of existence that the philosopher aimed to describe . Merleau-Ponty saw in Cézanne’s painting the playing out of the “ambiguity” that defines embodied existence and expression : the constant flux and reflux between, on the one hand, the originary, anonymous perception of “le fond de nature inhumaine sur lequel l’homme s’installe” , and on the other hand, a perception of the world appropriated by a subject through reflection ; a division and oscillation between“l’ordre spontané des choses perçues et l’ordre humain des idées et des sciences” . Cézanne’s late landscapes made visible existence’s hyperdialectic “circuit” with “nulle rupture”, in which it is “impossible de dire qu’ici finit la nature et commence l’homme ou l’expression” . Bernard’s description of Cézanne as irrevocably torn between “vision” or “vérité objective” on the one hand, and “système” or “logique mentale” on the other, was of particular importance for Merleau-Ponty. His Phénoménologie de la perception was largely an attempt to criticize, and find a way in-between, the strict dichotomies of objectivism and subjectivism, empiricism and intellectualism, physiology and psychology, sensation and thought, perception and reflection . In “Le doute de Cézanne”, Merleau-Ponty takes issue with Bernard’s comments, refuting the painter’s narrow-minded view of Cézanne by stating that what Bernard condemned as a paradoxical method was in fact Cézanne’s active rejection of “[les] alternatives toutes faites qu’on lui propose” . Indeed, Merleau-Ponty treats Cézanne’s project and his own as indistinguishable : “[au] lieu d’appliquer à son œuvre des dichotomies, qui d’ailleurs appartiennent plus aux traditions d’école qu’aux fondateurs, — philosophes ou peintres — de ces traditions, il vaudrait mieux être docile au sens propre de sa peinture qui est de les remettre en question” . The inserted “philosophes ou peintres” could not be more explicit. “Cézanne and I”, Merleau-Ponty tells us, “do not follow traditions ; we found them. We refuse to choose between the two sides of your dualisms for we seek to find a way in-between all antinomies, even if this means remaining in what appears to be an inevitable contradiction”. As Merleau-Ponty explains his task in La phénoménologie de la perception, “nous avons à décrire le milieu où cette contradiction est concevable”—that most ambiguous and paradoxical milieu : “l’existence” . In Merleau-Ponty’s mind, the objective of Cézanne’s painting was a similar embracing and depicting of the contradictions and paradoxes that define embodied existence. As I will attempt to show in the last section of this study, Cézanne’s achievement lay precisely in his heroic attempt to paint “le milieu où cette contradiction est concevable”. Fritz Novotny was another important force in shaping Merleau-Ponty’s engagement and identification with Cézanne. Novotny’s take on Cézanne’s late landscape paintings, one that stressed their “erschwerende Wirkung” of appearing as an inhuman “Vorwelt”, invited Merleau-Ponty to understand Cézanne as equally on a quest to describe the “primordial level” of perception and existence . In La phénoménologie de la perception, Merleau-Ponty cites Novotny’s article “Das Problem des Menschen Cézanne im Verhältnis zu seiner Kunst” (1932)  after describing Cézanne’s painting as “la restitution intégrale de [la] configuration sensible [des choses et des visages]” : “[c]’est ce que la nature fait sans effort à chaque moment. Et c’est pourquoi les paysages de Cézanne sont ‘ceux d’un pré-monde où il n’y avait pas encore d’hommes’ ” . Joachim Gasquet’s book, Cézanne (2nd ed., 1926) is the most cited source on the painter in La phénoménologie de la perception . Gasquet’s text, and especially the three imaginary dialogues entitled “Ce qu’il m’a dit…”, allowed Merleau-Ponty to reflect on Cézanne’s own statements on painting, vision, and nature . Cézanne’s recorded comments had particular weight in Merleau-Ponty’s formulation of two key concepts in his philosophy : le chiasme and expression . For Merleau-Ponty, the concept of le chiasme—that is, of the entrelacs (interlacing, intertwining) of subject and world, of seer and seen—was already encapsulated in Cézanne’s statement about his experience in the Aixois landscape : “le paysage se reflète, s’humanise, se pense en moi. Je l’objective, le projette, le fixe sur ma toile… il semble que je serais la conscience subjective de ce paysage, comme ma toile en serait la conscience objective” . In “Le doute de Cézanne”, Merleau-Ponty’s version of the painter’s statement excludes Gasquet’s version’s subjective/objective division—perhaps in order to avoid the strict dichotomies that his philosophy put into question—and retained a more direct statement of le chiasme : “le paysage, disait-il [Cézanne], se pense en moi et je suis sa conscience” . The way in which Merleau-Ponty here appropriates Cézanne’s own words and almost seems to become the painter, absorbing the blue sky in the Aixois landscape, was not a rare phenomenon. A similar, albeit more explicit, movement from painter to philosopher occurs in L’Œil et l’esprit when Merleau-Ponty cites Cézanne’s statement “la nature est à l’intérieur” as exemplifying the sort of “écho” or “formule charnelle de leur présence que les choses suscitent en moi” . In the later Le visible et l’invisible, the text in which the concept of le chiasme was formulated, one also cannot help but sense the presence of Cézanne, whose words seem to sneak out of Merleau-Ponty’s pen with no quotation marks to signal the appropriation : “le monde et moi sommes l’un dans l’autre… il faut dire que les choses passent en nous aussi bien que nous passons dans les choses” . In describing le chiasme, Cézanne’s words become Merleau-Ponty’s own, establishing a degree of reversibility of painter and philosopher, and testifying to the similarity between their conceptions of perception. In this way, Cézanne’s experience of the interpenetration between self and world played a central role in Merleau-Ponty’s formulation of one of his most important concepts. This passage places Cézanne at the center of Merleau-Ponty’s concept of expression, as the latter was formulated in La phénoménologie de la perception and “Le langage indirect et les voix du silence”(1952). 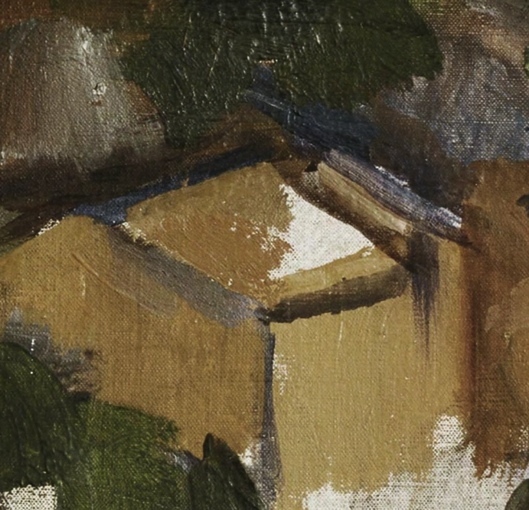 Cézanne’s comprehension that expression comes from the material, from the paint itself, and not from an explicit thought or desire to be expressive, defined Merleau-Ponty’s idea of artistic expression and, especially, of how a painting does not represent the world or a pre-conceived meaning—un sens. As Merleau-Ponty writes “le sens imprègne le tableau plutôt qu’il ne l’exprime” . Cézanne’s statements concerning the suppression of thought in the act of painting had even more influence on Merleau-Ponty’s concept of expression. In one of Gasquet’s dialogues, Cézanne states : “surtout si j’interprète trop…si je pense en peignant, si j’interviens, patatras ! tout fout le camp” . In his writings on literary and pictorial expression, Merleau-Ponty similarly stressed that “le tableau et la parole ne sont pas l’illustration d’une pensée déjà faite” , but rather that thought and meaning were only born in the act of expression and in the material itself. Instead of thinking and then painting, Cézanne said that he “pense en peinture” . For Merleau-Ponty, Cézanne exemplified how expression did not pass through reflexive thought, but rather was the unmediated movement from perception—and le chiasme—to gesture. Thought and meaning were born only in the act of painting, only given form in the paint itself. In his work on literature, Merleau-Ponty sought to explore whether such expression was also possible in writing. In the section of Merleau-Ponty’s Notes des Cours devoted to modern literature, his stated goal was to “chercher dans [la] littérature [l’]attestation de l’écrivain écrivant sous la dictée de ce qui se pense, ce qui s’articule en lui et qui retient l’essence même du visible” . What Merleau-Ponty was looking for, then, was a writer who, like Cézanne, testified to the interpenetration—le chiasme—of subject and world, and who was guided not by preformed thought, but by “ce qui se pense, ce qui s’articule en lui et qui retient l’essence même du visible”. Merleau-Ponty found this writer in Claude Simon (1913-2005). In his lecture notes from 1960-61, Merleau-Ponty creates an explicit parallel between Simon and Cézanne according to how they both ‘thought’ in their respective mediums. Merleau-Ponty first quotes Simon : “[r]estait à écrire la… perception ou la… je ne dirai pas pensée, je ne crois pas que je pense…”, and then comments : “[Claude Simon] pense comme Cézanne ‘pensait en peinture’, il parle avec sa voix et montre le monde, le fait voir d’un certain geste – mais ce type de dévoilement du monde, sans pensée séparée, est précisément ontologie moderne” . Merleau-Ponty’s aspiration to reveal that writers could “think” directly in written words, like Cézanne “pensait en peinture”, was thus the product of a more profound desire to show the similarity between his own philosophical project (“ontologie moderne”) and Cézanne’s painting. He wanted to show that philosophy could also pass directly from perception to expression “sans pensée séparée”. In L’Œil et l’esprit, we are thus not surprised when Merleau-Ponty states his aspiration to model his new ontology on painting : “[o]r, cette philosophie qui est à faire, c’est elle qui anime le peintre, non pas quand il exprime des opinions sur le monde, mais à l’instant où sa vision se fait geste, quand, dira Cézanne, il ‘pense en peinture’ ” . Cézanne exemplifies how expression could be unmediated by reflexive thought, and thus becomes the archetype for the philosopher who wants to show that the same could be possible in philosophy. But what does it mean for Merleau-Ponty that Cézanne could “pens[er] en peinture” ? In other words, how could the painter move from perception to expressive gesture “sans pensée séparée” ? To tackle these questions and to further comprehend Cézanne’s place within Merleau-Ponty’s philosophy of expression, I will need here to address the Merleau-Pontian idea of “le motif”. In English, the French word motif can be translated both as “motive” and as “motif”, and these two meanings will help to describe two interrelated conceptions of the role played by le motif in action and expression. First, the motif as motive : a motif, Merleau-Ponty writes, is a given situation, “the ensemble of ‘faits donnés’ ” presented through perception in any given experience . The motif is anterior to the décision—that is, to the action or gesture that the motif motivates—yet the relationship between the two is not simply one of cause and effect. The motif that “se propose”  in perception acts on the corps phénoménal through the motif’s certain way of being, its “style” , offering itself and the “sens”  inhabiting it to be accepted and confirmed by the décision . Therefore, while the motif “motiv[e] tacitement” the décision, it is the “décision qui affirme ce sens [du motif] comme valable et lui donne sa force” . For Merleau-Ponty, this reciprocal rapport of motif and décision, of a “situation comme fait” and a “situation assumée”  is one way of describing existence itself : “[l’]existence est le mouvement permanent par lequel l’homme reprend à son compte et assume une certaine situation de fait” . As always in Merleau-Ponty’s phenomenology, the two terms of this reciprocal relationship, motif and décision, are abstractions used to denote two poles of a circuit, two ideal limits that are impossible to separate or isolate, for neither exist without the other. That is, it is impossible to say precisely where the motivation of the motif stops and the décision begins in the movement of existence . The décision or action that accepts, continues and alters the “sens” of the motivating motif should be understood as the expression of the motif ; the décision and action the motif “motiv[e] tacitement” is in fact a rendering, or a testimony of the original contact with the given perceptual experience. Understanding this relationship between motivating motif and affirming décision as expression leads to the second moment or conception of the term motif : rendering the artist’s “motif” or subject matter in a given medium. If existence in every moment implies the movement between a contact with the motif and its expression through décision and action, then “[l]’acte de l’artiste ou du philosophe” is precisely the figuration of this movement, the way in which existence can be given a material form. Merleau-Ponty writes that “[l]’acte de l’artiste ou du philosophe est libre, mais non sans motif…[Leur liberté] consiste à assumer une situation de fait en lui donnant un sens figuré au-delà de son sens propre” . The act of expression undertaken by the painter or the philosopher is thus exemplary or archetypal of the very movement of existence inherent to every moment of being. The gesture of expression, leading from perception to creation, accepts, confirms and gives figurative or figured meaning (“sens figuré”) to the latent meaning presented by the motif in perceptual experience. In Merleau-Ponty’s writings, Cézanne’s own “motif” comes to the fore to help illustrate this twofold notion of le motif. For Merleau-Ponty, the motif most associated with Cézanne’s painting is the landscape around Aix and, as will be discussed in the next section, the Mont Sainte-Victoire. Merleau-Ponty writes in “Le doute de Cézanne” : “[p]our tous les gestes qui peu à peu font un tableau, il n’y a qu’un seul motif, c’est le paysage dans sa totalité et dans sa plénitude absolue – que justement Cézanne appelait un “motif’ ” . In La phénoménologie de la perception, Merleau-Ponty couples the two interrelated conceptions of le motif around Cézanne’s own “motif” when he writes : “que le sujet normal pénètre dans l’objet par la perception, s’en assimile la structure, et qu’à travers son corps l’objet règle directement ses mouvements”. The phrase is followed by an explanatory note citing Gasquet’s Cézanne : “[c]’est cette prise de possession du ‘motif’ dans son sens plein que Cézanne obtenait après des heures de méditation. ‘Nous germinons’, disait-il. Après quoi soudain : ‘[t]out tombait d’aplomb’ ” . Cézanne’s organic metaphor, “[n]ous germinons” gives powerful, visual and tangible weight to the Merleau-Pontian conception of the way the motif acts upon and motivates the gestures and actions of the perceiving subject. We might say, accordingly, that the natural seed of meaning “planted” in the body of the perceiving subject at the level of originary, primordial perception will “grow” into the painter’s expression as it is “cultivated”, both within the painter’s body and, in the figural sense, as the painter’s colors give “un sens figuré” beyond the latent meaning of the motif . This is precisely the movement of existence as exemplified by expression : the circular movement between “le fond de nature inhumaine sur lequel l’homme s’installe” , and the layer of the “monde culturel” marked by human thought and industry . This, in other words, is the movement reenacted in every moment of being “entre l’ordre spontané des choses perçues et l’ordre humain des idées et des sciences” . Cézanne’s “heures de méditation” and contemplation of the Aixois landscape, which motivated his expressive movements “à travers son corps”, thus give the very essence of Merleau-Pontian expression : the interpenetration (le chiasme) of painter and motif in the instant before the painter’s gesture, the application of colors to the canvas as a “témoignage”, a “trace de [son] contact avec cet objet et ce spectacle” . The description and the “réalisation”  of this reciprocal relationship that defines existence : this for Merleau-Ponty is the very “goal” of modern art and modern ontology . In order for the painter and the philosopher’s “réalisation” to be possible, they must be able to take into account and express the movement of existence and embrace the “contradiction fondamentale” existence entails . This contradiction, whose form and movement are suggested by the reciprocal relationship between motif and décision or artist’s gesture, can be stated in different ways and on different levels of existence, all entailing the “ambigüité”  of the embodied subject’s “mouvement permanent”  between two ideal limits of experience : between pre-reflexive perception and reflexive thought , between the perceived motif and the décision or gesture it motivates, or as Claude Lefort writes in the introduction to Merleau-Ponty’s Notes des Cours, as “une circularité entre l’expérience et la connaissance de l’expérience” that, unlike Hegelian dialectic, is a hyperdialectique with no synthesis, a “circularité sans terme” . Merleau-Ponty’s account of Cézanne’s “constitution schizoïde” explains what Bernard saw as “mortel dualisme”, Rilke as “conflict”, as having to do with Cézanne’s attempt to come to grips with the paradox inherent to existence and expression . In “Le doute de Cézanne”, Merleau-Ponty writes that, in relation to his œuvre, Cézanne’s schizophrenia should be seen as “une possibilité générale de l’existence humaine quand elle affronte avec conséquence un de ses paradoxes – le phénomène d’expression” . Cézanne’s schizophrenia is thus generalized into the schizophrenia that defines human expression and existence. This will help to explain a statement in “Le doute de Cézanne” that may, at first glance, appear as a strictly pathological view of Cézanne’s schizoid comportment : “ce sont les choses mêmes et les visages mêmes tels qu’il les voyait qui demandaient à être peints ainsi, et Cézanne a seulement dit ce qu’ils voulaient dire” . The way that Cézanne said in painting what the things he perceived demanded of him is in fact exemplary of the movement from motif to décision and action or gesture . To be sure, Cézanne’s schizophrenic method is for Merleau-Ponty an extreme case of the schizophrenia inherent to embodied existence that his own phenomenology sought to describe . This is the schizophrenia of being between, on the one hand, the originary, anonymous perception of “le fond de nature inhumaine sur lequel l’homme s’installe”, and on the other hand, this same perception of the world appropriated and transformed by the subject through reflection . In other words, underneath and anterior to the reflecting subject and conscious intentionality is found the pre-personal subject, an anonymous perception already conditioning and motivating behavior : “[n]ous retrouvions sous l’intentionnalité d’acte ou thétique, et comme sa condition de possibilité, une intentionnalité opérante, déjà à l’œuvre avant toute thèse ou jugement” . In Le visible et l’invisible, Merleau-Ponty explicates this existential schizophrenia with the idea of perception as ek-stase, the alienation of the perceiving self into the world, a perceptual experience only recovered, and put at a certain distance, through reflection. He writes : “[o]n dira donc qu’avant la réflexion, et pour la rendre possible, il faut une fréquentation naïve du monde, et que le Soi auquel on revient est précédé par un Soi aliéné ou en ek-stase dans l’Être” . Existence consists precisely in the ambiguity of being in-between the two selves, the “[s]oi aliéné” in the ek-stase of perception, and the “soi” proper asserted through reflection. The world is neither perceived as a pure “en-soi”, nor appropriated by reflexive thought as a pure “pour-soi” ; existence is “ce troisième terme entre le psychique et le physiologique, entre le pour-soi et l’en-soi” . In embracing this schizophrenic movement inherent to existence, Merleau-Ponty’s ontology thus found a stimulating counterpart in Cézanne, whose method was, albeit in another medium, the attempt to get beyond the dichotomy of perception and reflection by way of expression. Thinking through Cézanne’s method allowed Merleau-Ponty to envision in the act what was at the center of his philosophy : the “mouvement permanent” of being, reenacted in every moment of existence . “[L]a peinture”, Merleau-Ponty wrote in his lecture notes, “[est] une sorte de philosophie : saisie de la genèse, philosophie tout en acte” . “Distance” and “profondeur” are essential to an ideal limit of experience that cannot be had, but seen . Merleau-Ponty’s ontology is thus exemplified by the experience of visual perception . While there is never, in philosophy or perception, absolute coincidence between subject and “la chose même”, or “l’être brut ou sauvage”, vision offers a “coïncidence de loin”  : the “être brut” or the “fond de nature inhumaine” is always at a distance, always at the “horizon de l’En-Soi” . If this can perhaps be seen, it is because, Merleau-Ponty writes, “voir c’est avoir à distance” . And it is precisely painting that “ne célèbre jamais d’autre énigme que celle de la visibilité” . As Merleau-Ponty writes in L’Œil et l’esprit : “La peinture réveille, porte à sa dernière puissance un délire qui est la vision même, puisque voir c’est avoir à distance, et que la peinture étend cette bizarre possession à tous les aspects de l’Être” . This “délire” or “bizarre possession” that is the unique power of vision is one way to comprehend “profondeur” in Merleau-Ponty’s phenomenology, that is, the depth essential to the “univers de l’être brut” . Depth is not the abstract illusion of space constructed by geometric or planimetric perspective. If such were the case, Merleau-Pontian depth would have nothing to do with the sort of depth in Cézanne’s late landscapes, revolutionary paintings specifically associated with “The End of Scientific Perspective” . Instead, depth in Merleau-Ponty’s phenomenology is the simultaneous presence of disparate objects at different distances that coexist only in the gaze of the perceiver. As he wrote in Le visible et l’invisible : “les parties de ce monde ne coexistent pas sans moi : la table en soi n’a rien à voir avec le lit à un mètre d’elle” . Depth is the “champ de présence” given through visual perception, the way that all objects in my field of vision are equally present and equally demand my attention . Rendering this sort of depth was the achievement of Cézanne’s late landscape paintings. In Cézanne’s Mont Sainte-Victoire seen from Les Lauves (Zurich, 1902-6) (Fig. 2), all elements of the visual spectacle, mountain and field, sky and (green) clouds coexist with equal force, seem to intermingle on the same plane, and have the same ontological presence. Following Merleau-Ponty’s “la table en soi” example : in the case of Cézanne’s landscape, if we close our eyes and imagine Mont Sainte-Victoire in itself, we know that it “n’a rien à voir” with the fields that lay beneath it ; we know that if we measured the distance between the two, we could be certain that they should not be woven together on the same plane as they are in Cézanne’ painting. Or, in a photograph taken from a plane (planimetric perspective), we could have proof that the mountain is farther away from the studio at Les Lauves than the fields, and thus that it should not appear with the same force that it does in the painting. Yet depth seen by an embodied subject offers quite a different spectacle than the planimetric “profondeur survolée” or the “profondeur sous-entendue par [le] dessin perspectif” . Even if Cézanne knew that Mont Sainte-Victoire was further off than the fields at his feet, both mountain and field presented themselves to his eyes, coexisted in his visual “champ de présence”, and demanded their equal share of the painting . Perspectival or constructed depth would have been untrue to the original contact between viewer and world, rendered it artificial, and obscured the co-presence that defines visual perception. Cézanne’s landscape, therefore, is an embodiment of Merleau-Ponty’s depth, and illustrates what is meant when the philosopher describes painting’s essence as a “délire qui est la vision même”, the extension of “cette bizarre possession à tous les aspects de l’Être” . Fig. 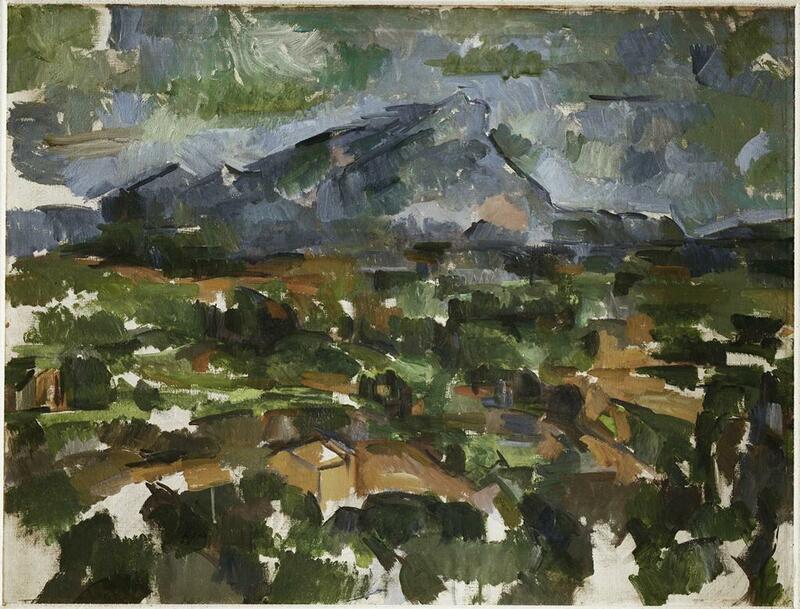 2 : Cézanne, Mont Sainte-Victoire seen from Les Lauves, 1902-1906, © 2012 Kunsthaus Zürich. All rights reserved. Merleau-Ponty’s description of depth, as exemplified by Cézanne’s late landscape paintings, is precisely what the philosopher calls “cette présence simultanée à des expériences qui pourtant s’excluent, cette implication de l’une en l’autre” . Again, this is not absolute simultaneity of disparate objects or experiences, and we are reminded that “l’univers de l’être brut” is always at the “horizon de l’En-Soi” : the objects of the visual field, whether we are looking at the landscape around Aix or Cézanne’s painted landscape painting, are only simultaneously present with the same force if “nous nous laissons être au monde sans l’assumer activement” . That is, absolute simultaneity of “tous les aspects de l’Être” occurs only in primordial perception, before perception is recuperated and put at a certain distance through reflection, only when the subject is in “ek-stase” in the world. Cézannian depth, the kind epitomized in his late landscapes, is thus characterized by the “overlapping” or “enveloppement” of visual presence and latency. This is perhaps a better way to approach the flatness—or simultaneity—of the parts in the Zurich Mont Sainte-Victoire seen from Les Lauves. Even if all the elements of the painting seem to comingle on the same plane, even if they are literally present to my field of vision with the same force, I can only focus on one at a time, I can only single out one aspect as figure (figure) while the rest will become ground (fond) . In the very instant I focus on the mountain in the painting, that is, if I pay attention to it, the surrounding area becomes the mountain’s ground, a “horizon indéterminé”  of latency, “[le spectacle] qui se prépare à être vu” . Yet this relationship between figure and ground is by principle reversible : if I stop looking at the mountain and give all my attention to the small brown house in the foreground, faintly indicated by a few black and blue brush strokes, the house becomes figure and the rest of the painting will become a “horizon indéterminé”, a ground of ever-potential vision. This is the “enveloppement d’un actuel inaccessible dans l’actuel accessible” . To be sure, this relationship between figure and ground is what defines every visible experience ; the possibility of perceiving an object as a figure against a ground is the very condition of the object’s visibility, “la définition même du phénomène perceptif” . So how could we speak of a characteristic depth, or of a unique relationship between figure and ground in Cézanne’s late landscapes ? Moreover, in this discussion of the relationship between figure and ground (figure/fond), what does Merleau-Ponty mean when he writes in “Le doute de Cézanne” that “[l]a peinture de Cézanne…révèle le fond de nature inhumaine sur lequel l’homme s’installe”  ? First, we need to understand what is at stake in the relationship between figure and ground in Merleau-Ponty’s phenomenology, something entailing much more than just the conditions of visibility. In La phénoménologie de la perception, Merleau-Ponty describes the act of paying attention as the “constitution active d’un objet nouveau” through perceiving as figure what was originally only sensed as ground or “horizon indéterminé” . This movement between ground and figure is in fact the same as the reciprocal relationship between motif and décision or gesture ; the object that moves from ground/horizon to figure is, Merleau-Ponty writes, “le ‘motif’ et non pas la cause” of this transformation . Finally, the relationship between ground and figure is identical to the movement from perception to thought : “[c]e passage de l’indéterminé au déterminé…c’est la pensée même” . Yet this movement is a “circularité sans terme”, a hyperdialectic that characterizes existence . The figure (thought, the visible) is never completely separated from the ground (perception, the invisible) : existence or lived perception consists in being in-between, in the “mouvement permanent” between the two . 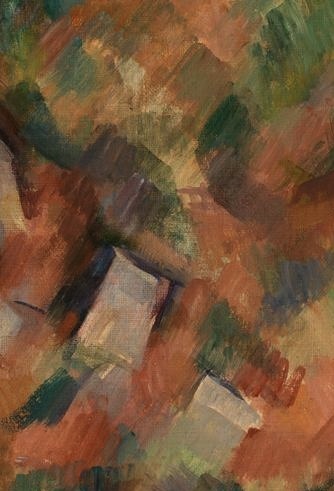 The “contour naissant”, in-between the non-contour of the ground and the full contour of the abstract figure or “la chose”, is for Merleau-Ponty not only an emblem of Cézanne’s painting, but also an image of the “ambigüité” of perception and existence he sought to describe . Looking closer at the mountain and the brown house in the Zurich Mont Sainte-Victoire, the only aspects of the painting with readable contours, we can see how this “contour naissant” is at play. I described earlier that the mountain or the house could be isolated as figure from the rest of the painting. However, to be more precise, their multiple, indistinct contours resist such a complete appropriation. Especially at the top left of the mountain, contours seem to hover around the ideal boundary of the mountain’s form (Fig. 3). They are broken apart, discontinuous, and allow sky and mountain to bleed together, making it in some places impossible to determine where the blue of the sky stops and the blue of the mountain begins. The contours of the brown house, while a bit more rectilinear, are treated similarly, with multiple strokes of blue and black that dissolve into the surrounding colors encroaching all around (Fig. 4). Fig. 3 : Detail of mountain from Fig. 2 © 2012 Kunsthaus Zürich. All rights reserved. These undetermined, vibrating contours give the mountain and the house the appearance of being in-between the indeterminacy of the majority of the painting, and a full-fledged object or contoured figure. Mountain and house, with their “contour naissant” are painted as they are coming into being : “la matière en train de se donner forme, l’ordre naissant par une organisation spontanée” . The contrast between the two partial figures and the ground of colors from which they emerge only makes the contour-less rest of the painting seem all the more resistant to the typical movement from ground to figure. We could perhaps imagine patches of color and brush strokes corresponding to groups of pine trees, olive green meadows, or plots of unsown fields, yet the colors or strokes in themselves do not motivate such assumptions. Instead, the middle ground of the painting offers the eye no resting place, no figure to concentrate on and from which to pull out of this painted “horizon indéterminé”, this endless “fond de nature inhumaine” . As Novotny wrote, the “fundamental characteristic”, the “paramount peculiarity” of Cézanne’s late landscapes, is precisely this “distance from humanity”, an image of nature “in the state of becoming, in status nascendi” . The unique depth or co-presence of objects in Cézanne’s late landscape paintings is characterized by this specific type of “overlapping” or reversibility of figure and ground, one which privileges ground and resists figure. If figures exist, they do so in “the state of becoming”, partially outlined against a ground of latency, the “fond de nature inhumaine” of strokes and colors that could be potential figures, yet resist the movement from ground to figure. Cézanne’s Rocks and Trees (1904) offers another example of what I am trying to describe (Fig. 5). To begin, the title of the work itself is revealing : “rocks and trees”, the only elements of the painting with identifiable contours, the only namable, recoverable parts of an otherwise distant, ineffable spectacle. Yet the contours delimiting the trees and rocks are neither completed nor stable. Rather, we find again Merleau-Ponty’s “contour naissant” : multiple, even multicolored contours that only partially demarcate figure from ground, allowing a certain degree of interlacing between the two. The very center of the painting offers a particularly powerful example of this sort of “overlapping”, an image of nature “in status nascendi” (Fig. 6). Two grayish rectangular rocks seem to be emerging from a ground of tight, multilayered strokes of pinks, blues and greens. Besides the rocks’ partial contours that allow the surrounding colors to encroach upon their forms, the shared tilted orientation of rocks and strokes also generates the bizarre effect of visualizing the rocks’ ontogenesis. The rock in the lower-right part of the detail, much less demarcated from ground than the other, is similar in form and size to the slanted groups of brush strokes surrounding it. This rock was originally just another bundle of strokes in the horizon/ground of latent figures. We see it now as it has begun growing out of the background, taking on contour and identity, eventually becoming more defined like the rock to its left. Yet even the rock to the left has only partially come into being ; the rock’s lower right corner is without contour, and the closer we look at its color, the more we realize that what appears as grey is in fact the blending or echoing of the surrounding colors. Fig. 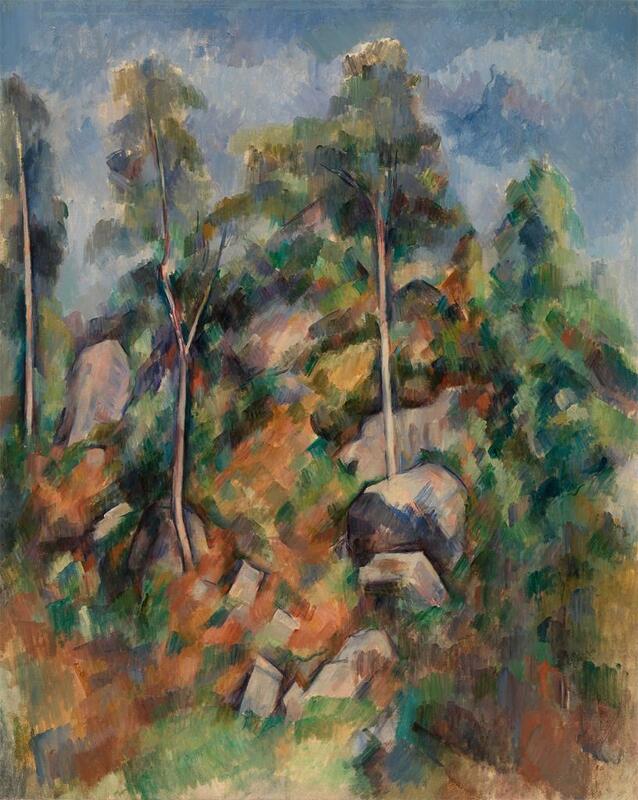 5 : Cézanne, Rocks and Trees, ca. 1904 © 2012 Barnes Foundation, Philadelphia. All rights reserved. Fig. 6 : Detail of center from Fig. 5. ©2012 Barnes Foundation, Philadelphia. All rights reserved. If the groups of strokes forming the ground from which these rocks emerge begin to suggest more rocks waiting to be born, the very presence of the partially contoured rocks abrogates our suppositions by identifying them as figures, thus putting the mid section of the painting back at its characteristic “distance from humanity” . Cézanne’s late landscapes seem to be characterized by this tension, a constant movement in-between latent ground and constituted figure, between the “paramount particularity” of the “fond de nature inhumaine” and “l’ordre humain” of namable, identifiable things, of our thoughts and our perceptions . This movement is the “mouvement permanent”  of existence at the center of Merleau-Ponty’s philosophy : the hyperdialectic “circularité sans terme”, the “circuit qui est nous” . “Dans ce circuit”, he writes, there is “nulle rupture”—it is “impossible de dire qu’ici finit la nature et commence l’homme ou l’expression”. That Cézanne could render in painting this circuit of existence is what made his paintings a visible form of Merleau-Ponty’s ontology, a “philosophie figurée” . One writer on Cézanne’s late landscapes perhaps saw something similar to Merleau-Ponty’s “philosophie figurée” of perception and of the “ambigüité” of existence : T.J. Clark. In his article “Phenomenality and Materiality in Cézanne”, Clark gives a reading of the ca.1904 Mont Sainte-Victoire Seen From Château Noir (Fig. 7), describing what he calls the “two possible vectors of materialism”, which “coexist” and “intermesh” in the visual experience of the painting . Clark first describes the immediate perception of the mountain : “the color is overall inhuman…the resulting texture is inorganic. The color is at an infinite remove from appetite, foodstuff, or flesh”. Next, the second moment of the visual experience he describes moves the viewer from this inhuman world to a more anthropomorphized, metaphorized, and thus humanized space : “[t]his only goes to make the bodily suggestions built into the landscape all the more telling once they present themselves. And surely they do before long. The main edges and declivities of the landscape lend themselves irresistibly to physiognomic reading-in” . In regard to Merleau-Ponty’s engagement with Cézanne, what is fascinating about Clark’s piece are these remarkable two moments (materiality/phenomenality) that he must, due to the specific temporal constraints of writing, describe separately, before saying that they intermesh together, that they are in conflict yet are interdependent. Like Merleau-Ponty’s two limits of the many dichotomies of existence, the two “vectors of materialism” Clark perceives are only ideally separate. They “intermesh”, Clark tells us, recalling Merleau-Ponty’s description of Cézannian space, a “philosophie figurée” characterized by “overlapping” or “enveloppement” , “[c]ette présence simultanée à des expériences qui pourtant s’excluent, cette implication de l’une en l’autre” . Fig. 7 : Cézanne, Mont Sainte-Victoire seen from Château Noir, ca. 1904, © 2012 Fordhouse, Michigan. All rights reserved. Everything is metaphor in it. Mountains are excuses for bodies. But equally, the picture is certain that it can put a stop to fantasy (to the Unconscious’s endless reading-in and gobbling up and multiplication of part-objects) by the singularity of its color and texture. They will make the mountain a mountain again – put it at a determinate distance. Make it an object that in its whole structure and materiality, as opposed to the mere accidents of surface, has nothing to do with us and our script. This is quintessential Cézanne, I think . Significantly, Clark’s “reading-in” of physiognomy and metaphor was suggested by “[t]he main edges and declivities of the landscape”, that is, by the landscape’s peculiar forms and contours . To be sure, the anthropomorphic shapes that Clark reads-in are not actually delineated in the landscape. If such were the case, there would be no intermeshing, no anthropomorphism, just description of an actual “languid body enjoying the sun” . Instead, something similar to a “contour naissant” vaguely demarcates the different planes and forms of the mountain, a similar sort of vibrating blue or black line. The contours of the landscape, which Clarks says “lend themselves irresistibly to physiognomic reading in”, could be said to motivate this anthropomorphism ; the physiognomic shapes are neither completely present, nor absent, they are given in a state of in-between, in “the state of becoming” . This must have something to do with Clark’s reluctance to situate the “unstoppable anthropomorphism” either as phenomenality or materiality . Clark states that the more he tries to describe “the two vectors of Cézanne’s dealing with the material world” the harder it is to situate them according to Paul de Man’s phenomenality–materiality scheme. Clark concludes, instead, by putting that dichotomy into question :“[n]o wonder we can never be sure when materiality ends and phenomenality begins. Each thrives interminably on the other’s images and procedures. An account of matter will never be rigorous enough, or vivid enough, to seal itself against the other’s metaphorical world” . Merleau-Ponty’s statement that in the hyperdialectic circuit of expression and existence, it is “impossible de dire qu’ici finit la nature et commence l’homme ou l’expression”  thus finds a striking counterpart in Clark’s phrase : “[n]o wonder we can never be sure when materiality ends and phenomenality begins”. The relationship between the “two vectors” even has the shape of Merleau-Ponty’s hyperdialectic : intermeshing or overlapping of contrary experiences, two limits of existence in constant movement and reversibility, similar to the Merleau-Pontian “circularité sans terme” . For Clark, this “intermeshing” is “quintessential Cézanne” . For Merleau-Ponty, this “overlapping” is “philosophie figurée”, painting that renders the fundamental ambiguity of existence . Merleau-Ponty’s engagement with Cézanne was not merely a passing interest. Nor do the philosopher’s writings on the painter exemplify of the “arrogance” of constraining an artist to fit into a “philosophical treatise”, as Merleau-Ponty’s “somewhat wayward ‘disciple’ ”  Jean-François Lyotard would have it . Indeed, Cézanne occupied a central place in all of Merleau-Ponty’s main texts on perception and ontology, texts spanning the philosopher’s entire career. Yet Cézanne’s role in Merleau-Ponty’s philosophy was not that of a mere example among others. Cézanne was a counterpart to Merleau-Ponty himself, a sort of painter/phenomenologist who was already aware, in painting and in perceiving, of le chiasme of subject and world, and of the movement and fundamental ambiguity that would come to define Merleau-Ponty’s concepts of expression and existence. As Forrest Williams suggested, there was indeed a “common ground”  between the two, ground that I interpret both as a similarity in their projects, and as the level of existence that occupied them both : “le fond [ground] de nature inhumaine sur lequel l’homme s’installe” . This profound “common ground” which defined the identification between philosopher and painter helps to explain what motivated Merleau-Ponty’s trip to Aix in the summer of 1960 (Fig. 1). Merleau-Ponty travelled to Aix and ascended Mont Sainte-Victoire to see Cézanne’s motif and experience the same chiasme that the painter had described—and painted. Painting in the Aixois countryside, Cézanne was able to “pens[er] en peinture”, circumventing the sort of reflexive thought that could only mar the original contact between subject and world. Merleau-Ponty had to travel to Aix to formulate a new ontology, a philosophy which would strive, like Cézanne’s painting, to be an expression—not a representation or an abstraction—of an originary contact with the world. 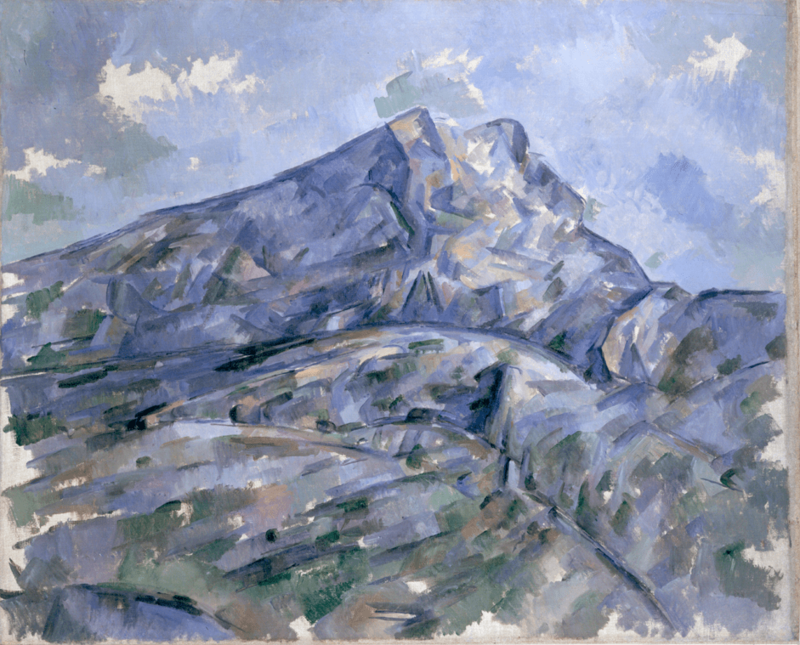 In their unique “overlapping” of figure and ground, Cézanne’s late landscapes offered Merleau-Ponty’s philosophy a visual form, a “philosophie figurée” of the hyperdialectic movement defining the ambiguity of expression and existence. In Le visible et l’invisible, Merleau-Ponty explained his new ontology as a description of what he termed “notre paysage ontologique”  . I would like to suggest that such a “paysage” looks like Cézanne’s own paysages of Mont Sainte-Victoire. Émile BERNARD, “La méthode de Cézanne”. Mercure de France, Mars 1, 1920, 289-318. T.J CLARK, “Phenomenality and Materiality in Cézanne”, in Material Events : Paul de Man and the Afterlife of Theory, ed. Barbara Cohen et al., Minneapolis, University of Minnesota Press, 2001, 93-113. Philip CONISBEE, “The Late Paintings of Montagne Sainte-Victoire”, in Cézanne in Provence, ed. P. Conisbee and D. Coutagne, Washington : National Gallery of Art, 2006, 280-90. Joachim, GASQUET, Cézanne, excerpts reprinted in Conversations avec Cézanne, ed. P.M. Doran, Paris, Macula, 1978, 106-61. Galen A. JOHNSON, The Retrieval of The Beautiful : Thinking Through Merleau-Ponty’s Aesthetics, Evanston, Northwestern University Press, 2010. Jean-François LYOTARD, “Philosophy and Painting in the Age of Their Experimentation : Contribution to an Idea of Postmodernity”, in The Merleau-Ponty Aesthetics Reader, ed. Galen A. Johnson, Evanston, Northwestern University Press, 1996. Maurice MERLEAU-PONTY, “Le doute de Cézanne” (1945), in Sens et non-sens, Paris, Nagel, 1949, 15-49. ––––––, “L’expression et le dessin enfantin” (ca.1951-52), in Œuvres, ed. Claude Lefort. Paris, Quarto/Gallimard, 2010, 1540-1544. ––––––, “Le langage indirect et les voix du silence” (1952), in Signes, Paris, Gallimard, 1960, 49-104. ––––––, Notes des Cours au collège de France : 1958-1959 et 1960-1961, ed. Stéphanie Ménasé, Paris, Gallimard, 1996. ––––––, L’Œil et l’esprit. (1960), Paris, Gallimard, 1964. ––––––, La phénoménologie de la perception. (1945) In Œuvres, ed. Claude Lefort, Paris, Quarto/Gallimard, 2010, 655-1167. ––––––, Le primat de la perception. (1946), Paris, Verdier, 1996. ––––––, La structure du comportement. (1942), Paris, PUF, 1967. ––––––, Le visible et l’invisible. (1964), in Œuvres, ed. Claude Lefort. Paris : Quarto/Gallimard, 2010, 1629-1787. Fritz NOVOTNY, Cézanne und das Ende der wissenchaflichen Perspektive, Vienna, Schroll, 1938. ––––––. “Das Problem des Menschen Cézanne im Verhältnis zu seiner Kunst.” Zeitschrift für Ästhetik und Allgemeine Kunstwissenschaft, B. 26 (1932), 268-298. ––––––. “The Late Landscape Painting.”, in Cézanne : The Late Work, ed. William Rubin, New York, MoMA, 1977, 107-11. Paul SMITH, “Cézanne’s Late Landscapes or the Prospect of Death.”, in Cézanne in Provence, ed. P. Conisbee and D. Coutagne, Washington, National Gallery of Art, 2006, 59-74. Forrest WILLIAMS, “Cézanne, Phenomenology, and Merleau-Ponty.”, in The Merleau-Ponty Aesthetics Reader, ed. Galen A. Johnson, Evanston, Northwestern University Press, 1996, 165-73. Christopher WOOD, ed. The Vienna School Reader, New York, Zone Books, 2000. Rainer Maria RILKE, Letters on Cézanne, trans. Joel Agee, New York, North Point Press, 2002. Lise des abréviations correspondant aux textes cités de Maurice MERLEAU-PONTY : DC : “Le doute de Cézanne” (1945), in Sens et non-sens, Paris, Nagel, 1949, p. 15-49. ExD : “L’expression et le dessin enfantin” (ca.1951-52), in Œuvres, ed. Claude Lefort. Paris, Quarto/Gallimard, 2010, p. 1540-1544. LIVS : “Le langage indirect et les voix du silence” (1952), in Signes, Paris, Gallimard, 1960, p. 49-104. NC : Notes des Cours au collège de France : 1958-1959 et 1960-1961, ed. Stéphanie Ménasé, Paris, Gallimard, 1996. OE : L’Œil et l’esprit. (1960), Paris, Gallimard, 1964. PP : La phénoménologie de la perception. (1945) In Œuvres, ed. Claude Lefort, Paris, Quarto/Gallimard, 2010, p. 655-1167. PrP : Le primat de la perception. (1946), Paris, Verdier, 1996. SC : La structure du comportement. (1942), Paris, PUF, 1967. VI : Le visible et l’invisible. (1964), in Œuvres, ed. Claude Lefort. Paris : Quarto/Gallimard, 2010, p. 1629-1787. For the Mont Sainte-Victoire and Cézanne’s time in Aix see Paul SMITH, Cézannes Late Landscapes or the Prospect of Death” and Philip CONISBEE, “The Late Paintings of Montagne Sainte-Victoire”, both in Cézanne in Provence, ed. P. Conisbee and D. Coutagne, Washington, National Gallery of Art, 2006, p. 59-74, 280-90. In Maurice MERLEAU-PONTY, Œuvres, edition established by Claude Lefort, Paris, Quarto/Gallimard, 2010, p. 89. Forrest WILLIAMS, “Cézanne, Phenomenology, and Merleau-Ponty”, The Merleau-Ponty Aesthetics Reader, ed. Galen A. Johnson, Evanston, Northwestern University Press, 1996, p. 165-73. Williams points out one such example : Ibidem, p. 173. “Projet d’enseignement”. See Lefort’s intro to the Quarto edition of MERLEAU-PONTY, Œuvres, p. 1427-28 for the dating of the unfinished Prose du monde manuscript. The Quarto Lefort edition has some selections (p. 1425-27). The text was published in 1962 as “Un inédit de Merleau-Ponty”, Revue de métaphysique et de moral, nº 4, A. Colin. MERLEAU-PONTY, Notes des Cours au collège de France : 1958-1959 et 1960-1961, ed. Stéphanie Ménasé with preface by Claude Lefort, Paris, Gallimard, 1996, p. 169, 174, 206. This text is cited below as “NC”. MERLEAU-PONTY, L’Œil et l’esprit, Paris, Gallimard, 1964, p. 32. This text is cited below as “OE”. MERLEAU-PONTY, La phénoménologie de la perception (1945), Œuvres, edition established by Claude Lefort, Paris, Quarto/Gallimard, 2010, p. 859. This text is cited below as “PP”. MERLEAU-PONTY, “Le doute de Cézanne”, (1945), Sens et non-sens, Paris, Nagel, 1949, p. 30. This text is cited below as “DC”. Forrest WILLIAMS, “Cézanne, Phenomenology, and Merleau-Ponty”, p. 165. The very first appearance of Cézanne in Merleau-Ponty’s writings is in a passage from La structure du comportement (1942) which, in fact, criticizes the painter. Cézanne is blamed for obscuring our understanding of originary perception by teaching us “à regarder les visages comme des pierres” (p. 181). I have omitted a discussion of this passage here because the change from this first instance of criticism to Merleau-Ponty’s establishment of Cézanne’s painting as no less than a counterpart to his own philosophical project merits an entire study in itself. The transformation of Merleau-Ponty’s view of Cézanne accompanies the profound evolution of his philosophy between La structure du comportement and La phénoménologie de la perception, thus, again, testifying to the central place Cézanne occupies in Merleau-Ponty’s thought. For an illustrative example, compare La structure du comportement, p. 181 and La phénoménologie de la perception, p. 1021. The three sources Merleau-Ponty consulted are Émile Bernard’s “La Méthode de Cézanne” (1920), the second edition Joachim Gasquet’s book Cézanne (Paris, 1926), and Fritz Novotny’s article “Das Problem des Menschen Cézanne im Verhältnis zu seiner Kunst” (1932). All are discussed below. Émile BERNARD, “La méthode de Cézanne”, Mercure de France, 1er mars 1920, p. 289-318. Cited at PP, p. 1022. PP : see especially the extensive introduction, p. 657-672. PP, p. 809 : “nous avons à décrire le milieu où cette contradiction est concevable, c’est-à-dire l’existence”. Fritz NOVOTNY, “Das Problem des Menschen Cézanne im Verhältnis zu seiner Kunst”, Zeitschrift für Ästhetik und Allgemeine Kunstwissenschaft, volume 26, 1932, p. 268-298. PP, p. 1021. The full passage from Novotny’s article is : “Die Ausschaltung des Subjekts in der Kunst Cézannes hat zur Folge, daß seine Landschaften – auch von dieser Seite her gesehen – oft wirken wie die einer Vorwelt, in der es den Menschen noch nicht gab, die Gegenstände seiner Stilleben nicht wie Dinge, die der Mensch zurückgelassen hat, und wenn dieser selbst dargestellt ist, so scheint er nicht von einem artgleichen Wesen gesehen zu sein” (p. 274, not p. 275 as Merleau-Ponty cites it in La phénoménologie de la perception). See also p. 275 : “Die Erscheinungsform des Außermenschlichen in der Kunst Cézannes und ihre Mittel im Einzelnen können hier nicht untersucht werden, seine Existenz ist dem Betrachter fühlbar als die in der Regel erste starke und oft Verständnis erschwerende Wirkung, die von den Gemälden Cézannes ausgeht”. See DC, p. 24 : In a passage criticizing Bernard’s depiction of Cézanne’s contradictory method, Merleau-Ponty writes : “Cézanne n’a pas cru devoir choisir entre la sensation et la pensée, comme entre le chaos et l’ordre…[I]l veut peindre la matière en train de se donner forme, l’ordre naissant par une organisation spontanée. Il ne met pas la coupure entre ‘les sens’ et ‘l’intelligence’, mais entre l’ordre spontané des choses perçues et l’ordre humain des idées et des sciences…C’est [l]e monde primordial que Cézanne a voulu peindre”. Cf. PP, p. 814, 885-85, 1017, 1022. As is well known, the authenticity of Gasquet’s dialogues is subject to doubt. As the editor of Conversations avec Cézanne writes, the dialogues “combinent l’authentique et le speculatif” and “ces conversations imaginaires valent plus pour l’atmosphère qu’elles dégagent que pour l’information qu’elles fournissent”(p. 106-107). “Chiasme” was only completely formulated in Le visible et l’invisible (p. 1741-80, esp. 1756-80), yet the concept is a common theme in Merleau-Ponty’s earlier texts on perception and ontology. For the concept of expression, see especially “Le Langage indirect et les voix du silence”(1952). Cézanne in Joachim GASQUET, Cézanne, excerpts reprinted in Conversations avec Cézanne, ed. P.M. Doran, Paris, Macula, 1978, p. 110. MERLEAU-PONTY, Le visible et l’invisible, (1964) in Œuvres, edition established by Claude Lefort, Paris, Quarto/Gallimard, 2010, p. 1750. This text is cited below as “VI”. MERLEAU-PONTY, “Le langage indirect et les voix du silence” (1952), Signes, Paris, Gallimard, 1960, p. 69. This text is cited below as “LIVS”. See also DC, p. 28, 32-33. Joachim GASQUET, Cézanne, p. 109. OE, p. 60 ; NC, p. 206. See also OE, p. 87. PP, p. 814. See also PP, p. 956 : “Cézanne disait que le peintre face à son motif va ‘joindre les mains errantes de la nature’ ” as exemplifying how expression itself is a “réponse à la question posée par les données et cette réponse est enveloppée dans la question”. PP, p. 859 ; see also PP, p. 808. Merleau-Ponty, “L’expression et le dessin enfantin”, (ca.1951-52) Œuvres, edition established by Claude Lefort, Paris, Quarto/Gallimard, 2010, p. 1543. This text is cited below as “ExD” ; see also LIVS, p. 80-81. PP, p. 671 : “[l]e monde phénoménologique n’est pas l’explicitation d’un être préalable, mais la fondation de l’être, la philosophie n’est pas le reflet d’une vérité préalable, mais comme l’art la réalisation d’une vérité”. ExD, p. 1543 ; see also NC, p. 205-206. PP, p. 1066 ; MERLEAU-PONTY, Le primat de la perception (1946), Paris, Verdier, 1996, p. 42. This text is cited as « PrP » ; see also PrP, p. 49-50 and PP, p. 809, 1066 : “[n]ous avons à décrire le milieu où cette contradiction est concevable, c’est-à-dire l’existence, la reprise perpétuelle du fait et du hasard par une raison qui n’existe pas avant lui et pas sans lui”(PP, p. 809). NC, p. 27. In Le Primat de la perception, Merleau-Ponty also calls this contradiction defining perception and existence the “paradoxe de l’immanence et de la transcendance”(PrP, p. 49). The two sides of this schizophrenia are, as with Merleau-Ponty’s treatment of any two conflicting terms of existence whose relationship is defined by a “circularité sans terme” (Claude Lefort in NC, p. 27 ; see also VI, p. 1723) of ideal limits. In other words, there is neither a moment of complete coincidence between them (simultaneity, synthesis), nor is any moment of existence purely on one side or the other (distinct thesis/antithesis). See PP, p. 808-809 and especially VI, p. 1718-23 ; the term “hyperdialectique” is the definition of the Merleau-Pontian conception of this movement that defines existence. Émile BERNARD, “Méthode de Cézanne”, p. 301, 293. Rainer Maria RILKE, Letters on Cézanne, trans. Joel Agee, New York, North Point Press, 2002, p. 33-34. See PP, p. 814 ; LIVS, p. 67-8. An extreme case, for Cézanne was perhaps more intent on subjecting himself to visual perception and less able to fluently let himself move from perception to expression (DC, p. 38). See also Merleau-Ponty’s account of schizophrenia in PP, p. 976-994, esp. 987-992. PP, p. 1134. See also PP : “[à] l’instant où je me tourne vers moi-même pour me décrire, j’entrevois un flux anonyme, un projet global où il n’y a pas encore d’ ‘états de conscience’, ni à plus forte raison de qualifications d’aucune sorte” (p. 1139) ; “[c]e qui est vrai seulement, c’est que notre existence personnelle repose sur une première assise d’existence acquise et figée” (p. 1137). VI, p. 1684. See also PP, p. 1133-35. PP, p. 803, n. 2. VI, p. 1729 ; my emphasis. See also NC, p. 168 : “[t]out notre effort pour penser le spectacle en soi ne peut l’évoquer que comme visible”. Because, in order for something to be seen, it must be at a certain distance from the viewer : “[n]ous n’avons pas d’autre manière de savoir ce que c’est qu’un tableau ou une chose que de les regarder et leur signification ne se révèle que si nous les regardons d’un certain point de vue, d’une certaine distance, dans un certain sens, en un mot si nous mettons au service du spectacle notre connivence avec le monde”(PP, p. 1134). See also VI : “[l]’immédiat est à l’horizon, et doit être pensé à ce titre, ce n’est qu’en restant à distance qu’il reste lui-même” (p. 1746). VI, 1751 ; also termed “proximité à distance” (VI, p. 1754). VI, p. 1712. See also VI, p. 1712 : “[c]ertes le monde est principalement et essentiellement visuel ; on ne ferait pas un monde avec des parfums ou des sons. Mais le privilège de la vision n’est pas d’ouvrir ex nihilo sur un être pur à l’infini : elle a, elle aussi, un champ, une portée ; les choses qu’elle nous donne ne sont pures choses, identiques à elles-mêmes et toutes positives, qu’aux très grandes distances, comme les étoiles, et cet horizon d’En-Soi n’est visible que comme fond d’une zone de choses proches qui, elles, sont ouvertes et inépuisables”. See also PP for distance as both spatial and temporal : “[q]uand je dis que je vois un objet à distance, je veux dire que je le tiens déjà ou que je le tiens encore, il est dans l’avenir ou dans le passé en même temps que dans l’espace » (p. 959). Immanence at “l’horizon de l’En-Soi” is equivalent to it always being at a distance, which in turn is the same as saying that there is a primordial, naïve perception of the world before it’s being recuperated, and put at a distance, through reflection. The “horizon de l’En-Soi” is always off in the future, latent, always at a distance, and thus also irremediably in the past, irrecoverable, “un passé originel, un passé qui n’a jamais été présent” (PP, p. 934). Fritz NOVOTNY, Cézanne und das Ende der wissenchaflichen Perspektive, Vienna, Schroll, 1938 ; important excerpts of Novotny’s book in The Vienna School Reader, ed. Christopher Wood, New York, Zone Books, 2000, p. 378-433. PP, p. 959. See also OE, 45-51, 83. NC, p. 167-8 ; see also OE, p. 64. PP, p. 686-705 ; especially 704-5. DC, p. 30. The fond Cézanne reveals is both the inhuman foundation and the ground (fond) in the figure/fond (figure/ground) relationship. DC, p. 27. For Merleau-Ponty’s ideas on contour in painting, see NC, p. 171-71 ; OE, p. 72-77 ; ExD, p. 1544. OE, p. 72 ; the ambiguity of existence that is captured by the movement of the hyperdialectic (VI, p. 1722-23). The “contour naissant” as in-between immanence (pure horizon) and transcendence (pure abstraction) thus is the very image of the “contradiction fondamentale”of existence. Cézanne’s contour is an emblem of Merleau-Pontian ontology, an emblem even of the embodied subject’s experience. PP, p. 705 ; DC, p. 30. Fritz NOVOTNY, “The Late Landscape Painting”, Cézanne : The Late Work, ed. William Rubin, New York, MoMA, 1977, p. 108. VI, p. 1715 : “…parce que la spontanéité consiste à être sur le mode du n’être-pas, la critique réflexive à n’être pas sur le mode de l’être et que ces deux rapports forment un circuit qui est nous”. OE, p. 86-7 : “[d]ans ce circuit, nulle rupture, impossible de dire qu’ici finit la nature et commence l’homme”. T.J. CLARK, “Phenomenality and Materiality in Cézanne”, Material Events : Paul de Man and the Afterlife of Theory, ed. Barbara Cohen et al., Minneapolis, University of Minnesota Press, 2001, p. 94. Even Clark’s emphasis on the mountain being “crystalline” resonates with Merleau-Ponty’s philosophy : “[la philosophie] reste question, elle interroge le monde et la chose, elle reprend, répète ou imite leur cristallisation devant nous. Car cette cristallisation qui, pour une part, nous est donnée toute faite, elle n’est pas ailleurs jamais terminée, et nous pouvons voir par là comment le monde se fait”(VI, 1728) ; my emphasis. T.J. CLARK, “Phenomenality and Materiality”, p. 94. Fritz NOVOTNY, “The Late Landscape Painting”, p.108. T.J. CLARK, “Phenomenality and Materiality”, p. 99. T.J. CLARK, “Phenomenality and Materiality”, p. 94 : “[The two vectors of materialism] stand in peculiar relation to one another, doubting and qualifying each other’s truth…they reinforce it. They exemplify the other’s account of matter––by showing it at the point it encounters paradox, and begins to follow contrary logic”. From the article, it is impossible to know how much Clark actually took from Merleau-Ponty, or if he consulted texts with references to Cézanne other than the well known “Le doute de Cézanne” and L’Œil et l’esprit. Moreover, the two references to the philosopher are ambiguous : first, a curt dismissal of Merleau-Ponty’s engagement with Cézanne as “hero worship” (Ibidm, p. 103). Next, a vague acceptance of Merleau-Ponty when Clark states that : “I want to go with [Fry, Greenberg and Merleau-Ponty] all the way” (p. 105). Besides those two instances, Merleau-Ponty goes unmentioned in Clark’s text. As Galen A. JOHNSON calls him in The Retrieval of The Beautiful : Thinking Through Merleau-Ponty’s Aesthetics, Evanston, Northwestern University Press, 2010, p. 210. For this disparaging reading of Merleau-Ponty’s engagement with Cézanne, see Jean-François LYOTARD, “Philosophy and Painting in the Age of Their Experimentation : Contribution to an Idea of Postmodernity”, The Merleau-Ponty Aesthetics Reader, ed. Galen A. Johnson, Evanston : Northwestern University Press, 1996, p. 323-35. Article précédentStratigraphie et architecture dans la Mésopotamie du IIIe millénaire : la maison XXXIII-XXXIV à KhafajiArticle suivantVocations d’historiens « de terrain » La quête d’une « Science historique appliquée » : des Combats pour l’Histoire de Lucien Febvre au fleurissement des nouvelles filières culturelles.